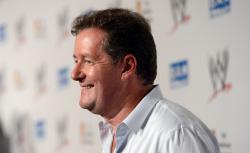 Should CNN Fire Piers Morgan? For what? For having an opinion? I only ask because the petition to deport him seems to be based on his “anti-Bill of Rights” stand on guns. And it appears that the petition seems to fly in the face of that whole First Amendment freedom of speech thing. That’s when Morgan called him stupid. Morgan didn’t spell out the part about how Newton, Conn., isn’t a city, but a town of fewer than 28,000. Nor that Columbine, Colo., is a “census designated place”—not even a town—that is smaller still at just over 24,000. Or that Virginia Tech is in the town of Blacksburg, population of less than 43,000—about the same size as Webster, N.Y., where a nut started shooting at firefighters the other day. He might have spelled that out in response to the comment about cities, but I suppose Pratt would have explained, “that’s why I brought up schools,” as if Adam Lanza had anything to do with Sandy Hook Elementary School before he decided to massacre its precious students and its brave teachers. So, while I’m not naive enough to believe that gun laws can solve America’s problems with gun violence on their own—and I don’t think Piers Morgan is either—I suspect that he’s not alone in thinking that Mr. Pratt is an idiot, that his comments were idiotic, and that someone just needed to come out and say it. In fact, I believe no one has been more persuasive in making the case for some restrictions on certain weapons, magazines, and ammunition than NRA head Wayne LaPierre has been. His arguments and proposals, so facile, so preposterous, so determined to turn us into a Third World country make the case better than any anti-gun zealot could hope to. I have to confess I rarely watch Piers Morgan (really, really, really rarely) and don’t care for his style when I do. I thought Larry King was utterly pointless, and I’m not particularly sure Piers Morgan has given that program a lot of reason to exist. But if he should be fired, it’s because CNN could make more money in his time slot doing something else, not because he called some guy stupid. And if they dare make him apologize, he should be crystal clear that he’s quite certain his guest is in fact stupid, but that he should have chosen far more delicate language to make the point. Should CNN have more attractive debate moderators? How will CNN’s acquisition of Zite affect its content? What is the future of CNN?